This article is about the administrative province of the Republic of China. For the province of the People's Republic of China, see Fujian. The current Fujian Province under ROC control was once part of a larger Fujian Province, which consisted of a mainland portion and some islands. After the Chinese Civil War of 1949, the majority of the historical province became Fujian, People's Republic of China, while the remaining islands remained under ROC control, which compose 0.5% of the ROC's territories. The first wave of immigration of the noble class arrived in the province in the early 4th century when the Western Jin dynasty collapsed and the north was torn apart by invasions by nomadic peoples from the north, as well as civil war. These immigrants were primarily from eight families in central China: Lin (林), Huang (黃), Chen (陳), Zheng (鄭), Zhan (詹), Qiu (邱), He (何), and Hu (胡). The first four remain as the major surnames of modern Fujian. Quanzhou was blooming into a seaport under the reign of the Min Kingdom, and is the largest seaport in the world. Its population is also greater than Fuzhou. Due to the Ispah Rebellion, Quanzhou was severely damaged. In the early Ming dynasty, Quanzhou was the staging area and supply depot of Zheng He's naval expeditions. Further development was severely hampered by the sea trade ban of the Ming dynasty, and the area was superseded by nearby ports of Guangzhou, Hangzhou, Ningbo and Shanghai despite the lifting of the ban in 1550. Large scale piracy by Wokou (Japanese pirates) was eventually wiped out by Chinese military and Japanese authority of Toyotomi Hideyoshi. 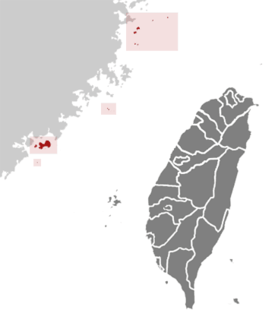 In 1956, due to heightened potential for military conflict with the PRC, the ROC central government moved the Fujian provincial government out of Fujian to within Taiwan Province in Xindian (now part of New Taipei), and the islands were placed under an extraordinarily tight military administration due to their extreme proximity to mainland China. This was an unusual situation where the government of a province was located and operating in a different province. With the easing of cross-strait relations between the PRC and ROC and the democratization of the ROC in the 1990s, the islands were returned to civilian government in 1992. On January 15, 1996, the provincial government moved back to Kinmen, on Fujian soil. Recently, the ROC has significantly diluted the powers of the two provinces it governs, namely Taiwan and Fujian. Most of the authority at the Fujian province level has been delegated to the two county governments of Kinmen and Lienchiang. The Governor of Fujian Province is the head of the Fujian Provincial Government, the governor is also titled the "Chairperson of the Fujian Provincial Government". According to the Additional Articles of the Constitution, the governor is appointed by the central government. The Fujian Provincial Government was located in Jincheng, Kinmen between January 1996 to 2018. In July 2018, the Executive Yuan decided to transfer the duties and functionalities of the provincial government to other branches under the Executive Yuan, including Kinmen-Matsu Joint Service Center and National Development Council The transformations are scheduled to be done by the end of year 2018. 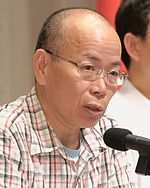 The Governor of Fujian Province is the only official in the provincial government after the transformations are completed. Chang Ching-sen, the last Governor of Fujian Province. 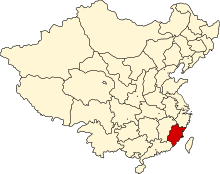 Fujian province comprises two counties: Kinmen County and Lienchiang County. These islands have a total area of 182.66 km2 (70.53 sq mi) and a total population of 71,000 (2001). The PRC claims Kinmen as Jinmen County, Quanzhou, Fujian; Matsu Islands as Mazu Township, Lianjiang County, Fuzhou, Fujian. ^ Between 1956 and 1996, Xindian City in Taipei County served as the seat of government. ^ "The personnel of the provincial government will be transferred to Kinmen-Matsu Joint Service Center, Executive Yuan". Retrieved 29 Nov 2018. Wikimedia Commons has media related to Fujian Province, Republic of China.